Our last day of our jaunt to the southern areas began much like the last one, breakfast, great coffee with a slightly sore back from the less than comfortable sleep. Packing was made easy after we had a load of washing done the day before (very cheaply may I add), so our clothes were folded to perfection. I took a last look from the bedroom balcony to the shiny pagodas up on the hill behind town before zipping my case and closing the hotel door behind us. I was a little sad to end this part of our trip, and looking back at my photos, I’m feeling deep regret for not taking more shots of the people and towns, as well as more of the temples and Buddhas. Sure I had taken a few, but honestly, it was so hot most of the time that I had become lazy. Oh well, gives me the perfect excuse to return (not that I need one). 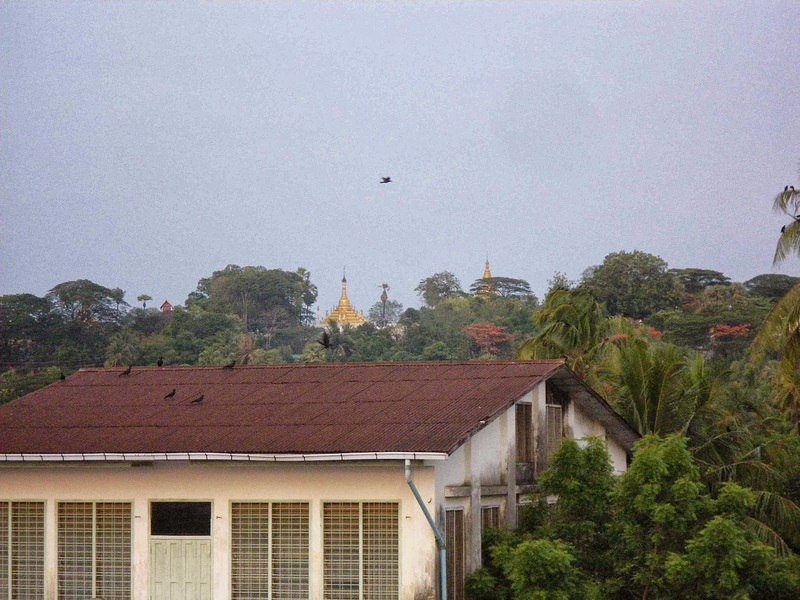 Kyaw picked us up around 8:30 to take us to a place a little off the beaten path, Nwar La Boh, or “hump” pagoda. From the moment I had read about it on Trip Advisor I knew I wanted to see it (in the same way as Golden rock). Half the reason I travel is to experience unique cultural sites and activities, and the less touristy the better. 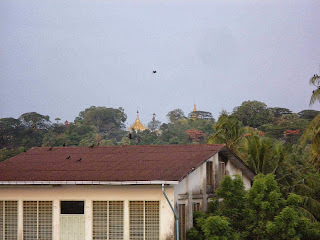 It was to the north of Mawlamyine, sort-of on the way back to Yangon. Kyaw suggested we get there pretty early in the morning with the hope there was a truck going up the mountain to the rocky temple. A row of tin-roofed shacks sat on a crumbling asphalt road marking the starting point of the journey. Up a little way, a tray truck, set up like the ones we rode in at Mount Kyaiktiyo, sat waiting under an open-sided shed. Compared to the Kinpun truck stop of Golden Rock, it was very basic. In peak times, the stalls and eateries would cater for may pilgrims, serving food and selling supplies. Unfortunately for us, as it was the start of the wet season, so there was no-one else here apart from a couple of families who lived here. We took a seat at one of the stalls while Kyaw talked with the locals. Retuning with his characteristic chuckle, he told us that a truck will go once there were at least eight people. “No problem. Just wait little time”. J and I were not at all worried, and enjoyed just relaxing. Out of the shade, it was approaching 40 under that blazing sun. Little kids ran in and out, smiling shyly at us while we waited. And waited… and waited. We chatted about various sights around Myanmar as I thumbed my LP guide book, as Kyaw gave me little local insider tips of what to see and when best to go. He also told me what I believe to be a local rumour (whether true or not, I have no idea). The monk who founded this pagoda was the very competitive brother of the monk who founded Golden Rock. He was so jealous of the fame his brother achieved with establishing Golden Rock, he set out to find an even more impressive rock formation to make a into a temple, and so established this site. An hour later, a car pulled up with four people. Shortly after, another four people walked in from the local town. Yey! That made ten. “OK you pay the driver 8,000 kyats each”, Kyaw explained. “Not so many people so cost more. Sorry for bit expensive”. Near the truck, some of the passengers were trying to haggle with the truck driver. Hard to know the outcome, but we all climbed up onto the truck’s plank bench seats, greeting each other with smiles. Unlike the previous truck trip, we had all the room we needed. Though I’m sure that at peak pilgrimage season, we would have been crammed in like sardines. Just like our trip up to Golden Rock, the ride itself was reminiscent of a roller coaster. Actually, it was worse. The road was an unsealed dirt track with hundreds of deep potholes. It was steeper and windier. And more scenic with amazing views back to Mawlamyine and surrounding ranges. Holding onto our hats, we laughed and shrieked along with the other passengers as the truck bumped and grinded its way up. At the top, a golden gateway, framed by a pair of clinthes, marked the entrance. We climbed from the truck onto a covered concrete platform that allowed easy access on and off. A short stroll up a paved walkway with a few sets of stairs lead us to a small monastery building. The locals stopped while an elderly monk recited prayers over them as they bowed their heads. Further up, another monk greeted us under a shaded pergola. Making appropriate hand gestures, he signalled that we needed to pay a camera fee, stuttering “Photo. Five hundred kyats”. Leaving J to pay, I wondered over to the holy rocks. Nwar La Boh is even more remarkable than Golden rock, with three skinny boulders perched precariously on top of each other. Legend has it that, like Golden rock, Buddha Hair relics have been placed in between the rocks to miraculously hold them in place. Like its more famous cousin, the rocks had been gilded in gold leaf. A number of tiled terraces provided viewing platforms to see the rock formations from a number of different angles. From some angles, the stack looked larger and more impressive, but at the top, you didn’t quite see just how perilously they rested. Off to the side, a set of stairs lead down to a flattened earthen clearing with a few small stupas, shrines, and a small building, presumably for solitary meditation retreats. Unlike all other stupas we’d seen, one was coated in silver rather than gold, which seems very different to us. Our travel companions had made their offerings and prayers at the rocks, and were now exploring this area and wondering off into the bush, leaving J and I alone in this unique site. Two foreigners, alone at a sacred site like this, surely didn’t happen every day – if ever. The rarity of this event was certainly not lost on us. Walking around the tiled pathway that encircled the rocks, J and I quietly examined and explored the other few shrines and statues, as well as took a heap of photos. Returning to the main alter area before the rock, a stunning blue lizard or iguana was resting on the rock near the top. Another plainer one scurried around the base below. I guess with most of the visitors departed, they had felt safe enough to come out again. For almost an hour, we wondered around and simply enjoyed the magnificent view. The others hadn’t come back, so J and I headed back to the truck stop, worried that maybe they had returned and the truck left without us. However, there was no sign of them back there either. Only a little stall with a family enjoying a meal. The truck was still parked at the loading platform, and the driver was over the way, also eating his midday meal. OK. They haven’t left without us. But where did the others go? Last I saw them, they were heading into the bushes near the top. We waited in the shade of the truck stop shelter, sipping water. By now the day was outrageously hot. Gee, I hope they’re OK I thought, wondering how I would ever be able to communicate to the locals that they had gone missing and to organise a search party. But, after a further fifteen minutes, the group appeared from the trees behind the stall. They were laughing and joking around among themselves. It appears they had gone gathering betel leaves (or so J and I concluded). Climbing onto the truck, they nodded and made fanning gestures indicating how hot they were from their little bush walk. We were sweltering simply sitting in the shade so I could imagine how hot they were. The trip back was quicker, and scarier, than the trip up as the truck travelled much faster down hill than up. Coupled with the ruts and potholes, the uneven track bounced us out of our seats a number of times, causing a few stifled screams followed by giggles of delight. It really was a relief to be back at the base. With a few waves and “Bye-bye’s” to our fellow travellers, we set off back toward Yangon. Back in the car, I started feeling a little unwell. Sort of funny in the tummy. Having not eaten since breakfast, I put it down to hunger and heat. We stopped at a little town for a late lunch after an hour, where the steamed rice and stir fried veggies hit the spot. The owner brought out beers for us, while his two sons practised their English with us as we ate. “Happy happy” said the owner, seemingly pleased to have had foreigners in his establishment. Small puppies circled at our feet as we enjoyed the cool beer. A few younger children from the neighbouring stalls popped their heads around the corner to see us foreigners, running away giggling when we smiled at them with a little finger wave. All the while, scooters and tractor-jalopy of various sizes came and went from the petrol station and other hardware stands. The town was like a hundred other along the road, the name of which I can’t find or see on any map (and I forgot to ask Kyaw), but the food and hospitality of the host were quite memorable. 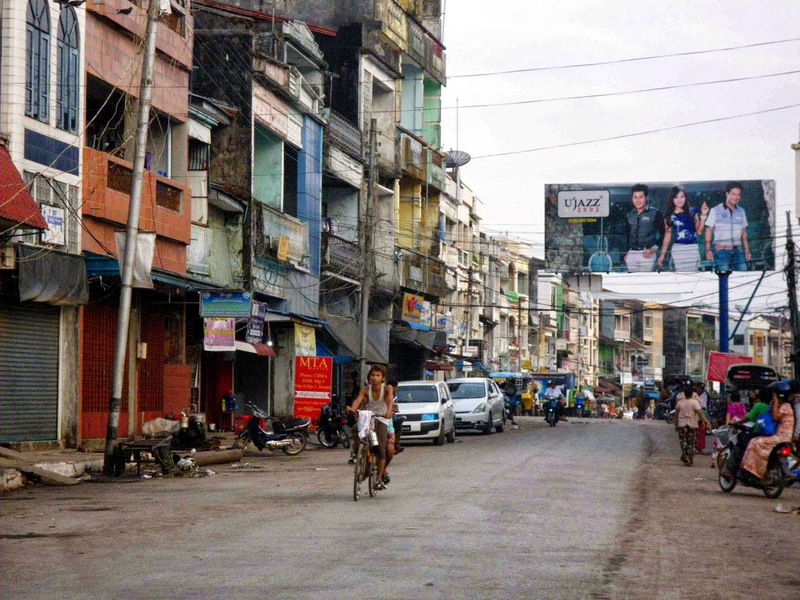 It took over four hours to return to the outskirts of Yangon. A new major highway made the last part very quick – that is until we hit the ‘no motor cycle zone’. 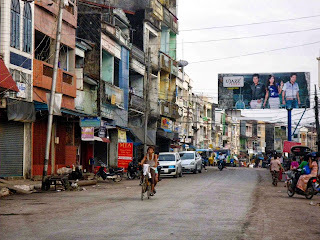 You see, the local government banned motorbikes in the main city of Yangon. Not far from the airport, there was a very distinctive difference to the traffic once we crossed that point. Suddenly, we were in the midst of a sea of cars; literally bumper to bumper. That last few kilometres to the Myanmar Life hotel close to Yangon airport took almost an hour. Time to bid a farewell to Kyaw, our jolly driver of the last five days. J and I had put aside a decent tip for him, with us both enjoying his careful and patient driving, as well as taking us to many lesser known places. “When you come back Yangon, you ring me I come drive you”. No problems. We actually arranged for Kyaw to pick us up from the airport in a few weeks when we returned for our last night in Myanmar before flying home. Check in was smooth, and our room a little non-descript but adequate. I flopped onto the firm bed quite exhausted from our travel. Don’t you find it extraordinary that sitting in a car or plane for hours in transit can be so tiring? That upset tummy feeling had returned, and I knew that this time it was not hunger. O-oh… please no travellers gastro. J went for a wonder up the local street to find some drinks and cigarettes, while I tried to relax. By the time he returned, my digestive system had hit a turning point – literally, making for a less than ideal night’s sleep. Oh well, nothing like a funny tummy for a 6am flight!